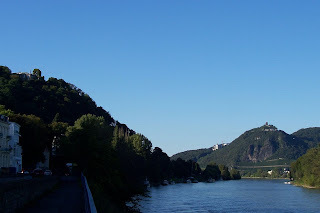 One of the things I like about where I live in Germany is that I am close to the Rhine River. 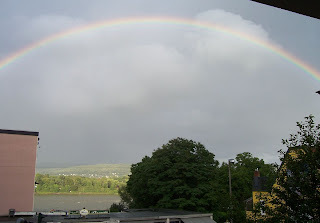 I am fortunate to have a view of the Rhine River from my apartment. These first two pictures were taken by me from my balcony looking towards the river. The first was obviously on a sunny day while the second I took after a storm had passed through. The Rhine River is about 700 miles long and it is the most important inland waterway in Europe. The Rhine flows from the Swiss Alps northward to where it empties into the North Sea. 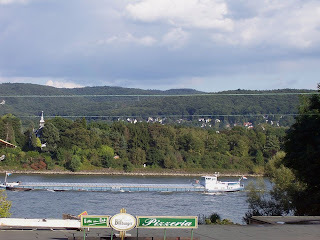 Here are two more pictures that I took of the Rhine that show some of the river traffic. In case you are wondering if I rented an airplane to take those pictures I have to say no, I just climbed a hill that lies to the west of the Rhine. On this hill there is an old castle ruins, which you can see in this picture below. On the very top left-hand side of the picture you can see the castle ruins I mentioned before. The castle on the right hand side of the picture is the same one I mentioned in a previous blog titled "Amazing or Ordinary" from last July. The Rhine River is quite a sight to see and I feel very fortunate to live so close to it. 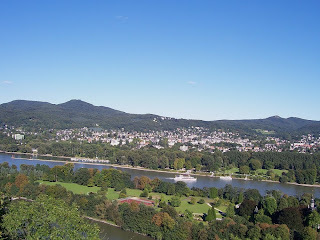 In fact, the advertisement for my apartment listed a view of the Rhine River as one of the apartment benefits. However, what was not listed is that on the side of my apartment where the Rhine is I also have a nice "view" of a very busy road and on the other side I have a nice "view" of the train. If you look carefully in the fourth picture you can see both the road and the tracks for the train. 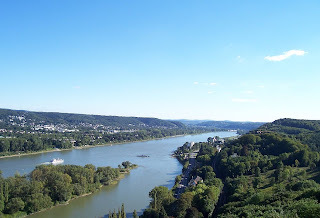 In spite of all that it is still a great place to live and I really enjoy being able to look out my window and have a view of the Rhine River. I am glad that I had a chance to check out your Blog site. You are right when you say how close to the Rhine River you are. Nice pictures. Take care for now! Beautiful pictures! I especially love the rainbow. We enjoyed visiting with you when you were in town.